"Absolutely beautiful. May our voices never be silenced." "What a great surprise to see! I love the visibility!" "Thank you! Glad to see something positive in these hard days!" "Thanks to everyone who made this happen! This made my day better!" And from Indiana University trustee Phil Eskew, "Terrific history lessons." These words of admiration were just a small sample of the feedback visitors submitted in the comment box next to the Legacy Wall exhibit in the Indiana Memorial Union’s East Lounge. The Legacy Wall is a traveling, interactive exhibit designed to raise awareness of the multiple contributions LGBTQ people have made to shared human history, to provide historically significant role models for LGBTQ youth, and to lessen the incidence of bullying in schools and communities by encouraging a culture of mutual respect. It is part of the Chicago-based nonprofit Legacy Project, which also created the Legacy Walk, a permanent, “outdoor museum” of LGBTQ+ history. While the Legacy Wall has traveled throughout Illinois, its appearance at IU was the first time the Legacy Wall has been in another state. 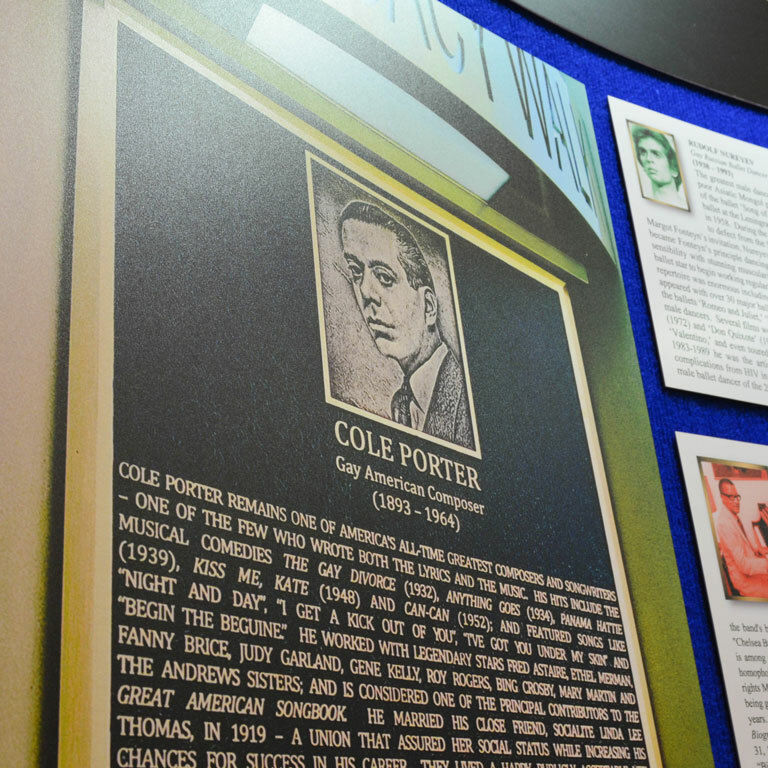 The exhibit, which includes influential LGBTQ+ figures throughout history—including legendary Hoosier composer Cole Porter and IU’s own Dr. Alfred Kinsey—was on display at IU from January 23 through February 3. “Right now, we need some historical perspective, as I think of younger people who just voted for the first time. I think this gives you an appreciation of history and diversity. At a time where there’s a lot of negative energy out there, this is ‘positive graffiti,’” said Doug Bauder, director of IU’s LGBTQ+ Culture Center, a program administered by IU’s Office of the Vice President for Diversity, Equity, and Multicultural Affairs (OVPDEMA). “I hope people felt connections, saw themselves, and said, ‘That could be me,’ or, ‘That’s my story,’ and walk away feeling better about themselves. There are any number of reactions people can have to something like this, but I sort of see it as a gift to the community. The response to it has been so positive, and we’re looking forward to it potentially appearing at other places in Indiana, possibly other campuses of IU. The exhibit was sponsored by the Union Board, the Kinsey Institute, the GLBT Alumni Association, and OVPDEMA. Charlie Schraw, an IU senior, helped bring the Legacy Wall to Bloomington as a former director of the Union Board. “I thought it was a really cool idea to have it showcased right as you walk into the Union. I think it’s something that now is especially relevant in light of the Pulse shooting and of course, the election,” said Schraw, a finance and information systems major from Wheaton, Ill. “A lot of the people were very impressed—and we’ve actually heard this a couple times—with the location of it and the production value of it. I think it’s awesome to celebrate marginalized individuals and that organizations like Union Board, the LGBTQ+ Culture Center, and other organizations that strive for inclusivity are making strides. I haven’t really come across something quite like it, but I really appreciate the important lectures and important discourse on recent events over the past year. I’m really proud to have this here at the Union. 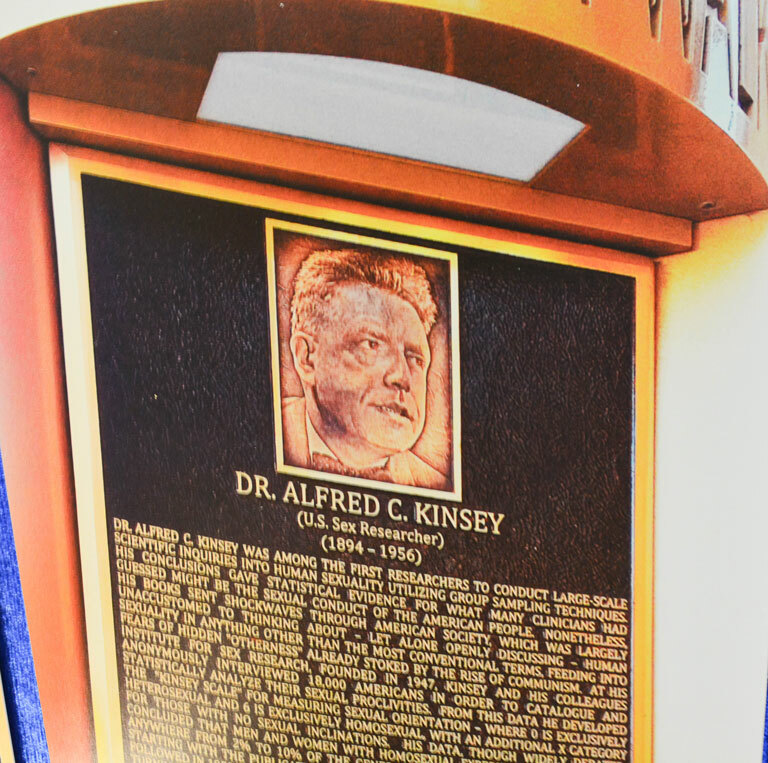 Michael Bedwell, a local activist and self-described “amateur gay historian,” attended the opening night of the exhibit and gave a lecture about Kinsey after the reception. Bedwell, whose idea it was to bring the Legacy Wall to IU, works as an advisor with Victor Salvo, the founder and executive director of the Legacy Project. At the reception, Tislam Swift, a second-year master’s student at the Jacobs School of Music, performed a Cole Porter song, in tribute to the late Indiana-born composer. 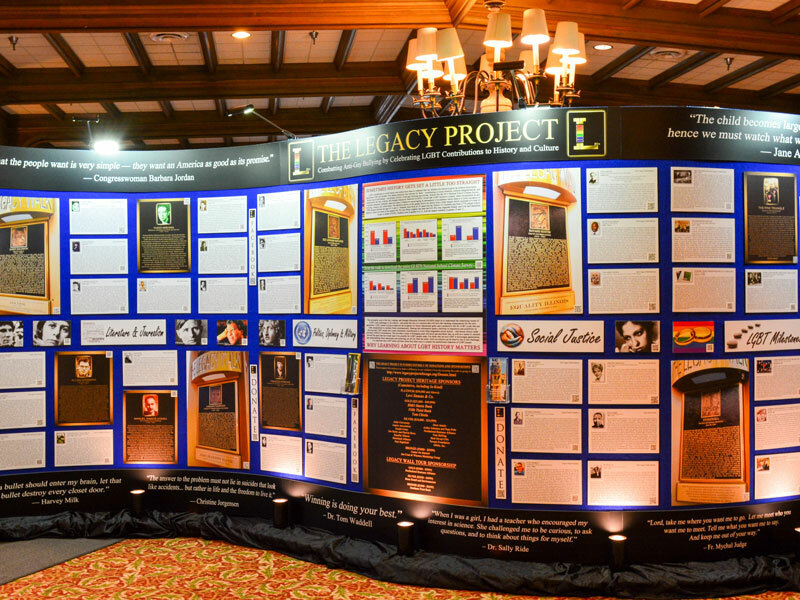 For more information about the Legacy Wall, please visit the Legacy Project’s website.